With so many bad things going on in the world, it would do all of us some good to take Mr. Roger’s advice on “looking for the helpers.” And it’s uplifting to see that this time around, the helpers are a group of people who aren’t always cast in the best light: the Ahmadiyya Muslim community. The recent government shutdown that started December 22, 2018, resulted in abandoned federal buildings, the closing of national parks, and approximately 800,000 workers without pay. This has been the longest government shutdown in recorded history so far. As a result, it has been reported that national parks have been left in utter disarray. But humanity is not all lost. 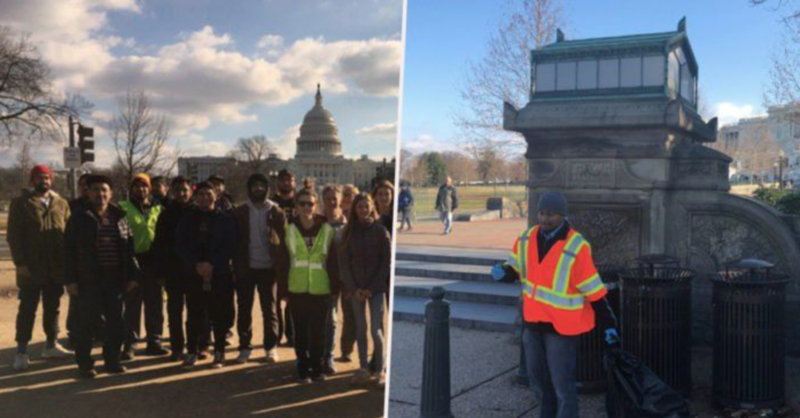 The Ahmadiyya Muslim Youth Association pitched in across the nation, from picking up trash outside of Independence Hall in Philadelphia, to Joshua Tree National Park, California. By coordinating through their official Twitter account, Ahmadiyya communities across the United States came together in their local communities to clean up our national parks. A Twitter call-out inviting members of the public to come together and help clean up The National Mall. A similar Twitter call-out for the Joshua Tree National Park. The group’s spokesperson, Salaam Bhatti said, “I hope it shows that we’re not here just to talk about Islam the whole time. We’re here to be part of America.” This statement is so important for others to understand, as it shows that Muslims, no matter what sect they belong to, adhere to the rules of the land that they reside in. Our loyalty never wavers in our countries, because our faith does not allow it to. It is ironic that this particular sect of Islam has stepped out and helped during this shutdown. Ahmadis are persecuted all over the world, from Indonesia, to Bangladesh, to the United Kingdom, and more. Pakistan is the only country where the law has stated Ahmadis to be non-Muslims. Even so, our spirit remains strong. In the U.S. alone, The Ahmadiyya Muslim Youth Association is the largest of its kind, with more than 70 chapters, and over 5000 members, and counting. According to spokesperson Bhatti, more than 60 percent of Americans do not know a Muslim personally. This nation-wide clean-up campaign is a great way for others to see what Islam is all about, and what we represent. This campaign has the potential to start a healthy, and educational dialogue, especially since it has been covered by far-reaching news outlets such as The New York Times, CNN, The Washington Post, and many more. It is a wonderful way for Americans to see Islam portrayed in the very best, and most authentic light. Being an Ahmadi Muslim myself, I am filled with pride for my religion, and my people. For we are portraying what Islam is authentically about, and inviting people to join in and help. We are Ahmadis, we are Muslims, and we are the helpers.